Is of course the most memorable of those events which gave something like reality to other suspicions which were baseless. There is little necessity for repeating the whole tangled story, and indeed there have grown around it so many doubtful excrescences, and the secrecy with which examinations were at that time conducted was so favorable to false reports being issued from political motives, that only the main narrative can be indicated without long explanations. The Catholics, who had expected some toleration for the exercise of their religion, were rendered desperate by the severities enforced against them. Fine, imprisonment, and persecution had been their constant experience, and there were hundreds of suffering gentlemen in the country who were moody and disaffected. 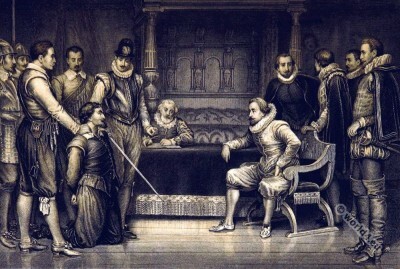 Few, however, were so ready for a mad and monstrous enterprise as Robert Catesby, a bold, determined, and reckless man, who had been engaged with Essex in his last treasonable attempt, had intrigued with France and Spain, and was now ready for almost any conspiracy, no matter how dangerous. It was he who imagined a scheme for destroying at one blow king, lords, and commons, but what he and his party were to gain by the success of such a hideous crime does not appear. Even those to whom he first mentioned his design were at first too much overcome with horror to assist him in it, but the representation of the sufferings of their co-religionists appears to have persuaded them to join him in the attempt. The first of these was Thomas Winter, a gentleman of Worcestershire, who would not agree to the plot till he had sought the mediation of the King of Spain who was then negotiating with James. He went over to the Netherlands,where he learned from the Spanish ambassador that no clause for the toleration of the Romanists could be obtained in the treaty. From that moment he determined to join Catesby, and accidentally meeting at Ostend an old friend and associate whom he knew to be a man of iron nerve and determined courage, enlisted him in the same cause and brought him back with him to England. This man was Guido Fawkes, who has sometimes been represented as a mercenary, consenting to join the conspiracy for a reward, but who was really a gentleman whose unshaken bravery was heightened to a pitch of indifference to personal safety or personal suffering by the intensity of his fanaticism. Having met Catesby in London they were joined by two others, Thomas Percy the relative and steward of the Duke of Northumberland, and John Wright Percy’s brother-in law and the best swordsman in England, both of whom were furious at James’s broken promises. But the accident of the coal-dealer who rented the vault under the parliament house removing his business, and wanting a tenant for his cellar, changed their plans (just as they were approaching completion), till the repeated prorogation of parliament. The conspirators grew uneasy, all but Fawkes, who seems to have become a mere monomaniac, permitting no other matter to occupy his thoughts than this set and deadly purpose. Others were meanwhile admitted to the plot: John Grant of Warwickshire, Robert Winter, the brother of Thomas Winter, Thomas Bates (Catesby’s servant), Sir Everard Digby, Ambrose Rookwood, and Francis Tresham. All was ready; these later members had money and fleet horses. The consultations were held at White Webbs, a house near Enfield, a wild and solitary place. The parliament was again prorogued till the 5th of November, and on that day the deed was to be done. There were thirty-six barrels of gunpowder in the cellar. Fawkes was to fire the train communicating with the mine by means of a slow match, which would give him time to escape. A ship hired with Tresham’s money was in the Thames, in which he was to proceed to Flanders. The conduct of Tresham from the moment of his joining the plot gave Cates by constant uneasiness. He was anxious by some means to warn the Lord Mounteagle, his close friend, so that he might not be involved in the tragedy. Sir Everard Digby and others of the conspirators also desired to take some means of preventing their particular friends from attending the parliament on that day. We know what followed: Lord Mounteagle, having sat down to supper in his mansion at Hoxton, had a letter delivered to him, said to have been left by an unknown messenger, and containing a mysterious warning. He carried the letter to Whitehall and showed it to Cecil, the king being out at Royston hunting the hare. On the king’s return the Lords Cecil and Suffolk, who had already penetrated the mystery, handed the mysterious letter to his majesty, who either guessing or being partly prompted to discover the import of the warning,afterwards received the full credit of that wonderful foresight which could interpret its meaning. This was on the 31st of October, and as it was determined to wait until the night before the meeting of parliament before frustrating the plot, it may be imagined that a coward like James needed some strong stimulus to his vanity to enable him to bear the suspense. (His maiestie’s speach in this last session … as neere his very words as could be gathered. Together with a discourse of the manner of the discovery of this late intended treason, ioyned with the examination, &c. &c. Imprinted at London by Robert Barker, printer to the king’s most excellent maiestie, anno 1605) “The king no sooner read the letter but, after a little pause and then reading it over a gain, he delivered his judgement of it in such sort, as he thought it was not to be contemned, for that the style of it seemed to be more quick and pithie than is vsuall to be in any Pasquil or Libell (the superfluities of idle brains).” The Earl of Salisbury knew James well, and played on this notion by objections which strengthened it. He quoted the sentence, ‘”For the danger is past as soon as you have burnt this letter,’ saying it was likely to be speech of a foole; for if the danger passed so quickly the warning could be of little worth. Againe, ‘that they should receive a terrible blow at their parliament, and yet should not see who hurt them.’ This, the king replied, pointed to theuse of gunpowder. He ‘therefore wished that before his going to parliament, the under room of the parliament house should be well and narrowly searched.’ Whereupon it was at last concluded, ‘that nothing should be left unsearched in those houses.’ And yet for the better colour and stay of rumour in case nothing were found, it was thought meet, that upon a pretence of Whyneard’s missing some of the king’s stuffe or hangings which he had in keeping, all those roumes should be narrowly ripped for them. And to this purpose was Sir Thomas Kneuet (a gentleman of his maiesties priuie chamber) employed, being a justice of the peace in Westminster, and one of whose ancient fidelitie both the late queene and our now sovereigne have had large proofe, who, according to the trust committed vnto him, went about the midnight next after, to the parliament house, accompanied with such a small number as was fit for that errand. But before his entrie in the house, finding Thomas Percye’s alleadged man standing without the doores, his cloathes and boots on at so dead a time of the night, he resolued to apprehend him, as hee did, and thereafter went forward to the searching of the house, where after he had caused to be ouer turned some of the billets and coales, he first found one of the small barrels of powder, and after all the rest to the number of thirty-sixe barrels, great and small. And there after searching the fellow whom hee had taken, found three matches, and all other instruments fit for blowing vp the powder, ready vpon him, which made him instantly confess his owne guiltinesse, declaring also veto him, that if he had happened to be within the house when he tooke him, as hee was immediately before (at the ending of his worke) hee would not haue failed to haue blowen him vp, house and all. “Thus after Sir Thomas had caused (him) to be surely bound and well guarded by the company he had brought with him, he himself returned backe to the king’s palace, and gaue warning of his successe to the lord chamberlaine and Earle of Salisburie, who immediately warning the rest of the councel that lay in the house, as soon as they could get themselves ready, came, with their fellow counselors to the king’s bed-chamber, being at that time near foure of the clocke in the morning. And at the first entrie of the king’s chamber doore, the lord chamberlain, being not any longer able to conceale his ioy for the preuenting of so great a danger, told the king in a confused haste, that all was found and discovered, and the traitor in hands and fast bounds.